In recent years, we’ve seen a huge upswing in popularity of Edison light bulbs. You know the kind – the ones with the golden glow, antique look, and café feel. They’re popping up everywhere! They’re a great way to set the stage for events or the perfect lighting for settings around the home. But, like anything, Edison bulbs have their own benefits and drawbacks. There’s a good reason why Edison-style lighting has become so popular recently – it’s art! Working like an incandescent, their filaments and bulbs are curved into unique and fascinating shapes. The wire inside creates a fiery glow, emitting a warm, golden light showing off their distinctive beauty. There is a “not so bright” side to Edison bulbs, though. You’ll most often see Edison bulbs used in an area that doesn’t need as much functional light as ambiance lighting. This is because Edison lights just aren’t as bright as other standard incandescent bulbs or LEDs. If you install Edison bulbs for task lighting, such as in a bathroom vanity, you’ll be disappointed. But, install them as accent lighting over a dining table, and you’ll create a warm, inviting space. If you opt for vintage-style Edison bulbs over standard bulbs, you can expect to lose quite a bit of luminosity. A 60-watt Edison bulb emits roughly half the lumens as an A19 incandescent. And, because Edison bulbs also have a lower/warmer color temperature than standard bulbs, their orangey-glow doesn’t fully illuminate the room, rather than emphasize their amber glass casing. Another consideration when designing a space with Edison lighting is that the bulbs are less efficient than modern LEDs and CFLs. They give off the majority of light as heat, so they may not be ideal for people trying to keep their home temperature cooler. Edison bulbs are also notoriously easy to break, so they may not be a good match for homes with pets or kids, or in areas where they could be easily bumped. In addition, Edison bulbs are typically over twice the price as standard bulbs. If you want to create the perfect ambiance, Edison Bulbs might be worth the added costs. After all, they instantly add a unique, vintage ambiance to the room. Just don’t expect them to fully illuminate an area where you really need to be able to see. Simply put, they may not be the right choice for every room. If you love the look of Edison bulbs (and let’s be honest, of course you do), but want a longer lasting bulb, you may want to consider LED filament bulbs. They bear a similar look but use LED light emitters in the bulb. LED filament bulbs offer 15,000 life hours as opposed to the 1,000 hours of incandescent Edison bulbs. (However, for comparison, a typical LED boasts a 50,000-hour life.) In some rooms, it may make sense to mix Edison bulbs with other light fixtures at higher positions (like the photo at the right) for a versatile lighting mix that meets the needs of various activities. • Hang Edison bulbs at varying lengths over your dining table. • Use Edison-style lights to add visual appeal to clean, modern designs. • Install Edison bulbs in the living room on a dimmer switch to dial-in the perfect amount of light to set the mood. • String outdoor-rated lights from your patio fence or along walkways to create a warm ambiance. • Consider Edison-style LED string lights for added durability and versatility. Edison bulbs are being used in homes, stores, and restaurants everywhere! They’re a great way to incorporate a vintage feel into minimalist design and instantly add functional art. For more information about using lighting to create a beautiful home, contact the lighting design experts at White’s Electrical today. 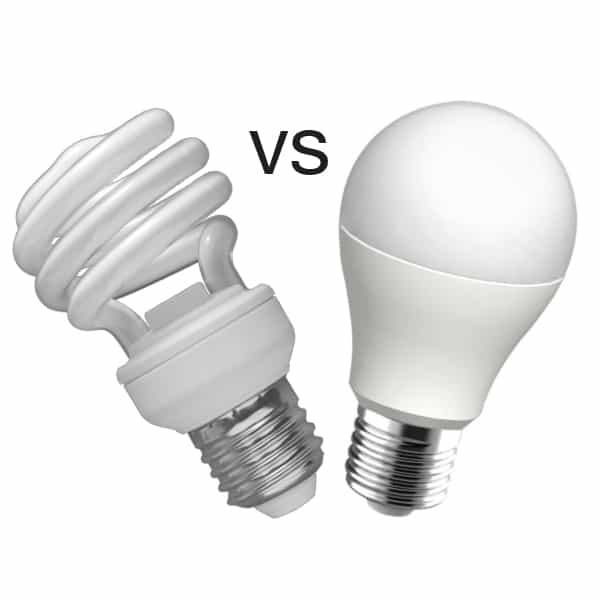 What are the Differences between LED and Fluorescent Light Bulbs? What goes through your head when you need a light bulb? Probably not much, except dollar signs. In this blog, we compare the differences between LED and fluorescent light bulbs and discuss the cost benefits of each. If you’re concerned primarily with initial costs, LEDs, or light-emitting diodes, likely won’t be your first choice. They are initially more expensive than fluorescent light bulbs. However, they last longer. LEDs have a lifespan of about 50,000 hours. As an added benefit, they maintain their brightness as they age, so they won’t ever dim. Not only LEDs long lasting, but they are also energy efficient. Compared to traditional lighting, LEDs have an estimated energy efficiency of 80 to 90 percent. They also contain nontoxic materials, as opposed to some fluorescent bulbs, and are 100 percent recyclable, which lessens their carbon footprint. Another advantage to LED bulbs is their ability to provide instant light, right as they are turned on. Some fluorescents, on the other hand, take a couple minutes to reach maximum brightness. As mentioned, LED bulbs are more expensive than other lighting choices. This is because they require more manufacturing technologies and sophisticated engineering since they’re a directional light (the diodes emit light in a single direction as opposed to fluorescents, which emit light 360°. LED light bulbs are also sensitive to changes in temperatures and are more prone to overheat in high temperatures. The biggest draw for fluorescent bulbs is their low cost. Initially, they cost less than LEDs. Many consumers would rather pay a small amount every so often than pay a large amount all at once. Consumers are also drawn to fluorescents because of their convenience. Fluorescent bulbs are the all-in-one bulb. They can easily light up a full room because they emit light in every direction. And for this reason, they work better in lamps than LEDs. The same bulb can be used in ceiling lamps and in the garage — in other words, they’re more adaptable; specialized bulbs need not be purchased for specific applications. Fluorescent bulbs are also popular because they can last for upwards of 10,000 hours, and many times they come with a warranty of only one or two years. While the lifespan pales in comparison to LEDs, it is nonetheless much longer than the lifespan of traditional incandescent bulbs. Like LEDs, fluorescents are also energy efficient, though not quite to the same degree. Because fluorescent bulbs are meant to be used for long periods, they use 75 percent less energy and 90 percent less heat than incandescent bulbs. Though fluorescents initially cost less than LEDs, they cost more over their lifetime because they consume more energy and burn our faster. They’re also easier to break than LEDs. Another disadvantage to fluorescent bulbs is that they contain mercury. The mercury is harmless until the bulb breaks. When that happens, mercury is released as a vapor, which can be inhaled or settle into fabric. If a person comes in contact with enough mercury, it can lead to poisoning. Fluorescent bulbs also emit UV radiation. Usually, a protective coating absorbs the UV light, but the UV can escape if a “light leak” occurs when the protective coating is damaged or begins to peel off. If you’re interested in LED lighting for your home or business, call Whites Electrical in Indianapolis. We specialize in LED retrofitting and can get your home or business up to an energy-efficient standard.